Drones could shape the future of technology, especially if provided with reliable command and control (C&C) channels for safe and autonomous flying, and high-throughput links for multi-purpose live video streaming. Some months ago, Prabhu Chandhar’s guest post discussed the advantages of using massive MIMO to serve drone – or unmanned aerial vehicle (UAV) – users. More recently, our Paper 1 and Paper 2 have quantified such advantages under the realistic network conditions specified by the 3GPP. While demonstrating that massive MIMO is instrumental in enabling support for UAV users, our works also show that merely upgrading existing base stations (BS) with massive MIMO might not be enough to provide a reliable service at all UAV flying heights. Indeed, hardware solutions need to be complemented with signal processing enhancements through all communications phases, namely, 1) UAV cell selection and association, 2) downlink BS-to-UAV transmissions, and 3) uplink UAV-to-BS transmissions. These are outlined below. As depicted in Figure 1(a), most existing cellular BSs create a fixed beampattern towards the ground. Thanks to this, ground users tend to perceive a strong signal strength from nearby BSs, which they use for connecting to the network. Instead, aerial users such as the red drone in Figure 1(a) only receive weak sidelobe-generated signals from a nearby BS when flying above it. This results in a deployment planning issue as illustrated in Figure 1(b), where due to the radiation of a strong sidelobe, the tri-sector BSs located in the origin can be the preferred server for far-flung UAVs (red spots). Consequently, these UAVs might experience strong interference, since they perceive signals from a multiplicity of BSs with similar power. Figure 1. (a) Illustration of a downtilted cellular BS and its beampattern: low (blue) UAV receives strong main lobe signals, whereas high (red) drone only receives weak sidelobe-generated signals. (b) 150-meter-high UAVs (red dots) associated with a three-cell BS site located at the origin and pointing at 30°, 150°, and 270°. The three BSs of each cellular site (orange squares) generate ground cells represented by hexagons. On the other hand, thanks to their capability of beamforming the synchronization signals used for user association, massive MIMO systems ensure that aerial users generally connect to a nearby BS. This optimized association enhances the robustness of the mobility procedures, as well as the downlink and uplink data phases. During the downlink data phase, UAV users are very sensitive to the strong inter-cell interference generated from a plurality of BSs, which are likely to be in line-of-sight. This may result in performance degradation, preventing UAVs from receiving critical C&C information, which has an approximate rate requirement of 60-100 kbps. 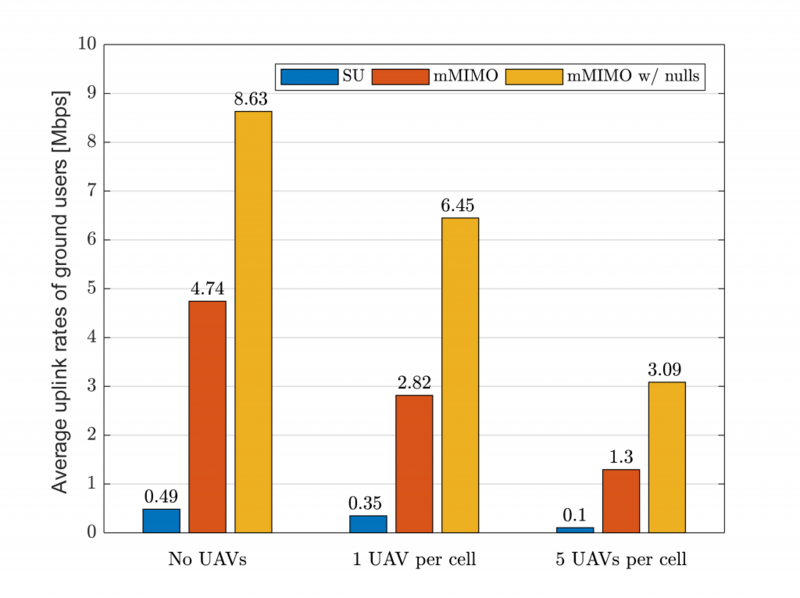 Indeed, Figure 2 shows how conventional cellular networks (‘SU’) can only guarantee 100 kbps to a mere 6% of the UAVs flying at 150 meters. A conventional massive MIMO system (‘mMIMO’) enhances the data rates, albeit only 33% of the UAVs reach 100 kbps when they fly at 300 meters. This is due to a well-known effect: pilot contamination. Such an effect is particularly severe in scenarios with UAV users, since they can create strong uplink interference to many line-of-sight BSs simultaneously. In contrast, the pilot contamination decays much faster with distance for ground UEs. In a nutshell, Figure 2 tells us that complementing conventional massive MIMO with explicit inter-cell interference suppression (‘mMIMO w/ nulls’) is essential when supporting high UAVs. In a ‘mMIMO w/ nulls’ system, BSs incorporate additional signal processing features that enable them to perform a twofold task. First, leveraging channel directionality, BSs can spatially separate non-orthogonal pilots transmitted by different UAVs. Second, by dedicating a certain number of spatial degrees of freedom to place radiation nulls, BSs can mitigate interference on the directions corresponding to users in other cells that are most vulnerable to the BS’s interference. 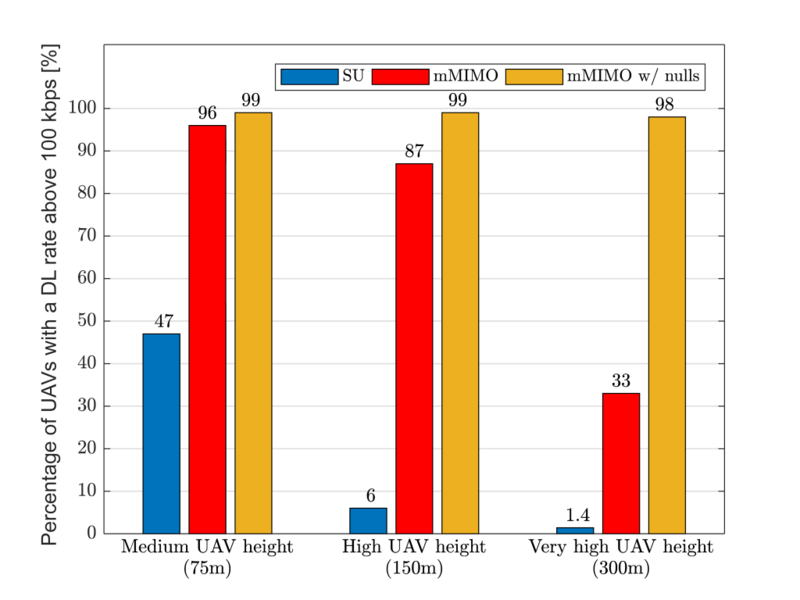 Indeed, these additional capabilities dramatically increase the percentage of UAVs that meet the 100 kbps requirement when these are flying at 300 m, from 33% (‘mMIMO’) to a whopping 98% (‘mMIMO w/ nulls’). Figure 2. Percentage of UAVs with a downlink C&C rate above 100 kbps for three representative UAV heights. ‘SU’ denotes a conventional cellular network with a single antenna port, ‘mMIMO’ represents a system with 8×8 dual-polarized antenna arrays and 128 antenna ports, and ‘mMIMO w/ nulls’ complements the latter with additional space-domain inter-cell interference suppression techniques. Unlike the downlink, where UAVs should be protected to prevent a significant performance degradation, it is the ground users who we should care about in the uplink. This is because line-of-sight UAVs can generate strong interference towards many BSs, therefore overwhelming the weaker signals transmitted by non-line-of-sight ground users. The consequences of such a phenomenon are illustrated in Figure 3, where the uplink rates of ground users plummet as the number of UAVs increases. Again, ‘mMIMO w/nulls’ – incorporating additional space-domain inter-cell interference suppression capabilities – can solve the above issue and guarantee a better performance for legacy ground users. Figure 3. Average uplink rates of ground users when the number of UAVs per cell grows. ‘SU’ denotes a conventional cellular network with a single antenna port, ‘mMIMO’ represents a system with 8×8 antenna dual-polarized antenna arrays and 128 antenna ports, and ‘mMIMO w/ nulls’ complements the latter with additional space-domain inter-cell interference suppression techniques. Overall, the efforts towards realizing aerial wireless networks are just commencing, and massive MIMO will likely play a key role. In the exciting era of fly-and-connect, we must revisit our understanding of cellular networks and develop novel architectures and techniques, catering not only for roads and buildings, but also for the sky.